Boeing employees are volunteering with us to build rain barrels for YOU! Snohomish Conservation District up-cycles 55-gallon drums and converts them into rainwater harvesting tools. Rain barrels give you a ready supply of water for your garden and help reduce stormwater runoff. 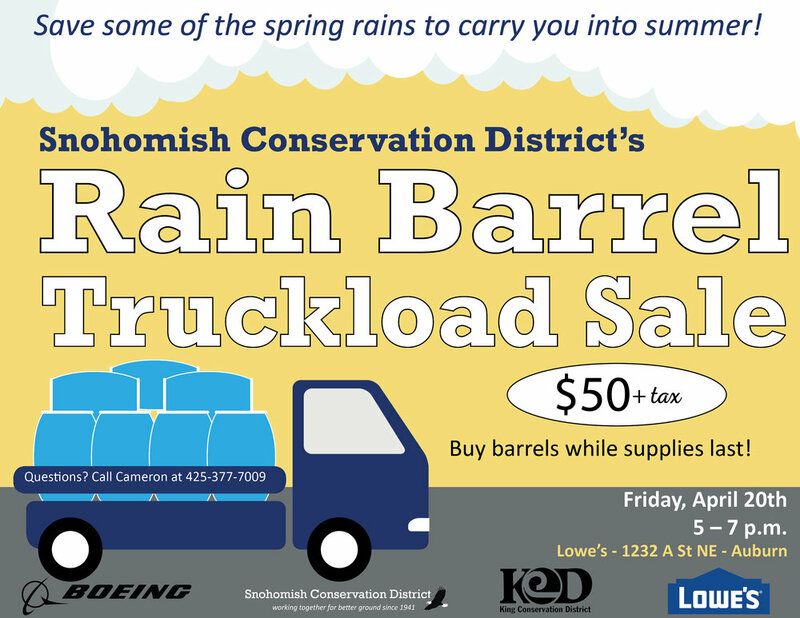 Boeing volunteers will be preparing barrels for a special pop-up rain barrel sale at Lowe's in Auburn on Friday, April 20th from 5 - 7 p.m.
Pre-order have closed. Pick up or buy onsite at the Auburn Lowe's, while supplies last! Barrels are $50 plus tax. On the day of the pop-up sale, purchases of barrels may be made with debit/credit card or check, while supplies last. All barrels need to be picked up at the Auburn Lowe's on the day of the pop-up sale! Partners include The Boeing Company, Lowe's, and King Conservation District.